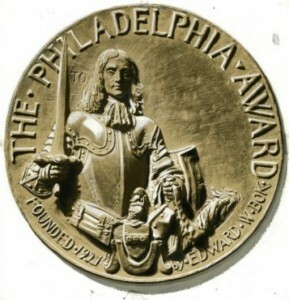 The Philadelphia Award medal depicts William Penn on this side and Jesus on the other, with the words, “I am among you as he that serveth.” It was designed by Philadelphia artist Violet Oakley. 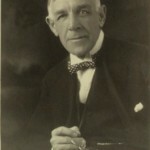 Bok, who retired in 1919 at the age of fifty-six, believed that the last third of a successful man’s life should be dedicated to helping others. Retirement, he believed, allowed the mind to “rest, refresh, exhilarate,” and nothing better provided that state of mind than public service. While a strong believer in free enterprise and upward mobility—Bok rose from poor immigrant to successful businessman—he knew that individual economic success alone did not solve society’s problems or provide true self-fulfillment. 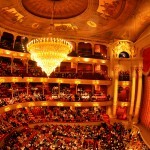 The first winner of the Philadelphia Award, in 1921, was Leopold Stokowski, conductor of the Philadelphia Orchestra. 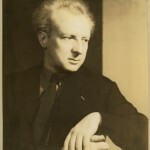 Stokowski was credited with transforming the Philadelphia Orchestra from one widely regarded as staid and mediocre to an orchestra considered exciting and innovative. Stokowski was appointed director of the Philadelphia Orchestra and made his debut on October 11, 1912. Stokowski became known as a musical showman, due to his theatrical gestures while conducting. 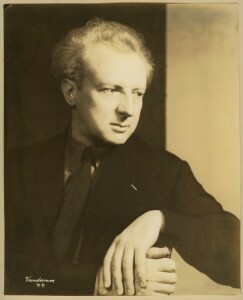 In 1938, Stokowski met with Walt Disney and offered to conduct the music for the Sorcerer’s Apprentice, originally a short film, but was expanded into the feature length film Fantasia. Stokowski convinced Disney to record the soundtrack in Philadelphia with the Philadelphia Orchestra, a session that took place in the Academy of Music from April 3 to April 7, 1939. 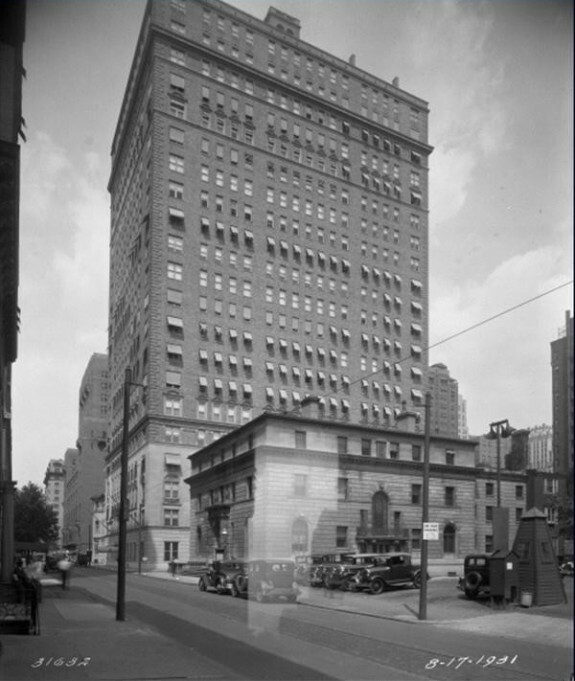 The presentation of the Philadelphia Award took place at the Academy of Music from 1921 until 1950, except for a smaller gathering in 1930 at the Barclay Hotel (shown here in 1931) that was also a memorial for Edward Bok. After 1950 the award ceremony often occurred at the Barclay. Convinced that publicizing and rewarding do-gooders would encourage more people to do good, Bok established the Philadelphia Award, a $10,000 (later $25,000) annual prize. He appointed nine trustees who would select the awardees. The event took place at the Academy of Music until 1950; the one exception was the smaller gathering in 1930 at the Barclay Hotel that was also a memorial for Edward Bok. After 1950 the award ceremony often occurred at the Barclay Hotel. The event included a speaker, who focused on a topic that, however tenuously, related to the admirable work of the awardee. The speaker then introduced the winner of the award (kept secret prior to the ceremony until 1964), who was presented with an embossed scroll, ivory casket, gold medal designed by renowned artist Violet Oakley (1874–1961), and the check. Recipients of the award have included such outstanding members of the Philadelphia community as Eugene Ormandy (1899–1985; 1965 award), the brilliant conductor who, along with Stokowski, established the Philadelphia Orchestra as among the finest orchestras in the world. Eli Kirk Price II (1860–1933; 1928) and Fiske Kimball (1888–1955; 1950) were instrumental in not only establishing a public art museum, the Philadelphia Museum of Art, but also making it into one of the world’s greatest. Samuel Fleisher (1871–1944; 1923) and Jane Golden (b. 1953; 1997) brought art to the masses with the Graphic Sketch Club (later the Fleisher Art Memorial) and the Philadelphia Mural Arts Program. Marian Anderson (1897–1993; 1940) was the first African American award winner. A Philadelphian from a modest background, she triumphed to become one of the twentieth century’s greatest and most popular classical singers. Joan Myers Brown (b. 1931; 2009) also broke through racial barriers. A professional dancer, Brown had encountered pervasive racial discrimination in Philadelphia’s dance community. In 1970 Brown cofounded Philadanco to provide opportunities for African American dancers and encourage them to achieve the highest standards. 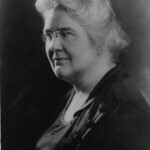 The first woman to win the award, Lucy Wilson (1864–1937; 1933), was a progressive educator who founded South Philadelphia High School for Girls. Other educators include Marcus Foster (1923–73; 1968), principal of Simon Gratz High School, who transformed a demoralized, low-performing school into one of the best in the Philadelphia public school system, and the Rev. 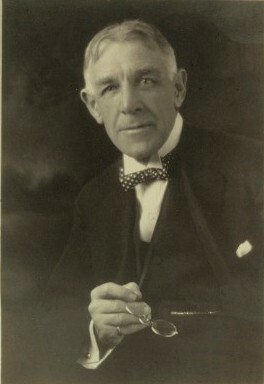 Russell Conwell (1843–1925; 1922), founder of Temple University, an outgrowth of adult education classes at his church. Conwell believed that inexpensive college education was essential if all Americans were to have a chance of upward mobility. The many scientists who have won the award testify to Philadelphia’s importance as a center for medical and scientific research. Chevalier Jackson (1865–1928; 1926) invented the bronchoscope. John Gibbon Jr. (1903–73; 1963) invented the pump oxygenator, commonly known as the heart-lung machine. Using this machine, Gibbon was the first person to successfully perform open heart surgery. Ruth Patrick (1907–2013; 1973), who worked as a scientist at the Academy of Natural Sciences at a time when there were very few women scientists in Philadelphia, became one of the world’s leading environmental scientists, influential in developing standards for clean water. 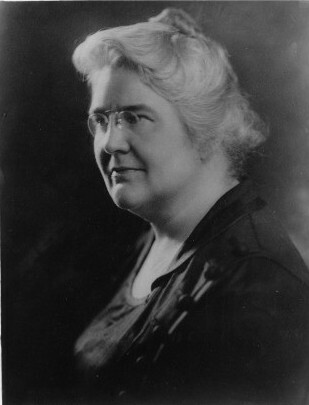 Several awardees provided services for the homeless, including George Wilkins (1889–1978; 1936), Sister Mary Scullion (b. 1953; 1991), and Gloria Guard (b. 1945; 2004). Others helped revitalize Center City, such as the builder Willard Rouse III (1942–2003; 1986) and Paul Levy (b. 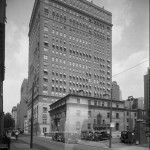 1947; 2005), who developed the Center City District. Anderson, Marian. My Lord, What a Morning: An Autobiography. New York: Viking Press, 1956. Bok, Edward. The Americanization of Edward Bok. New York: C. Scribner’s Sons, 1920. Glantz, Joseph. Philadelphia Originals. Atglen, Pa.: Schiffer Publishing, 2009. Lukacs, John. Philadelphia, Patricians and Philistines, 1900–1950. New York: Farrar, Straus, Giroux, 1981.
Pepper, George Wharton. Philadelphia Lawyer: An Autobiography. Philadelphia: Lippincott, 1944. Roberts, George and Mary Roberts. 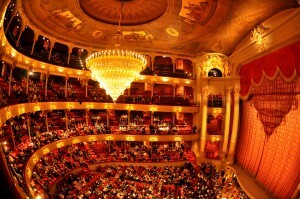 Triumph on Fairmount: Fiske Kimball and the Philadelphia Museum of Art. Philadelphia: Lippincott, 1959. Weigley, Russell, ed. Philadelphia: A 300-Year History. New York: W. W. Norton, 1982. 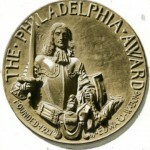 Philadelphia Award Records (Collection 3081), Historical Society of Pennsylvania, 1300 Locust Street, Philadelphia.